Who carves a wooden catfish? I do, and I loved it. The first thing that caught my eye in this book was a wooden catfish. I knew right away that it wanted to be on wheels and be a toy – hence the birth of Captain Catfish. The pattern in the book was fun and the instructions were great. I really enjoyed carving this fish. I was a little less happy with the bird patterns though. The birds all had side view patterns but no top view. There was only one photo even that showed a top view during the patterning stage. All 0f the fish had both top and side patterns to use. 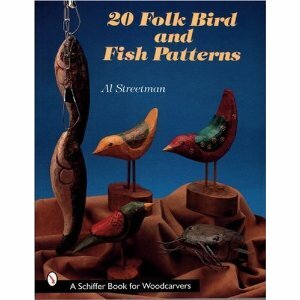 I wanted this book specifically for the birds, the fish was really just a bonus for me. This makes the book less desirable to me. The Author published his phone number and address in the back of the book but the phone number was no longer valid when I called. I emailed the publisher to ask if there were side patterns to have and did not get an answer. If you are most interested in the bird patterns on the cover of the book, I would not buy this book. If on the other hand, you are into Captain Catfish! (hehe), he is probably worth the cover price alone. This entry was posted on March 11, 2010 at 6:02 pm and is filed under Book Reviews, Carving. You can follow any responses to this entry through the RSS 2.0 feed. You can leave a response, or trackback from your own site.